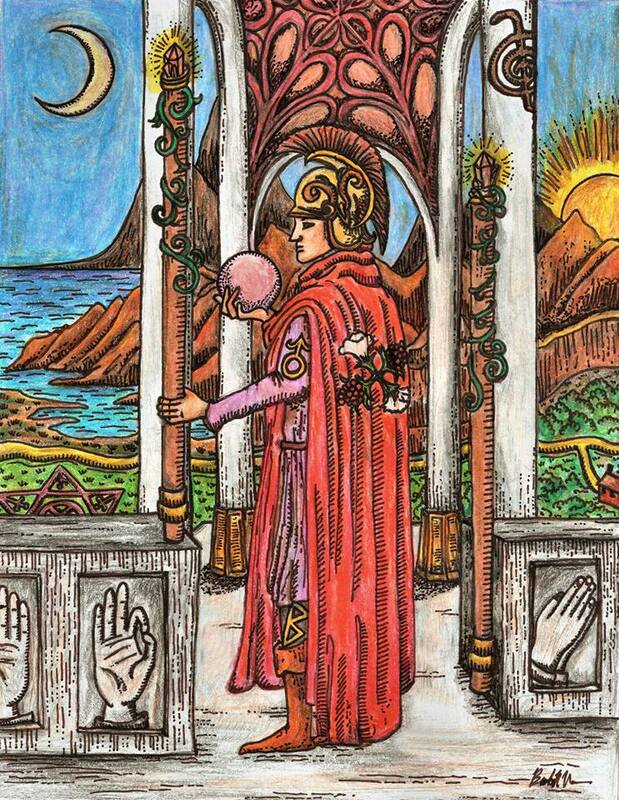 Tarot Pink for Cancer is a collaborative tarot deck project organized by Ron Leong, founder of Tarot eCards, a digital app for storing electronic versions of whole tarot decks on your smartphone. The mission of the collaborative tarot deck project is to raise funds for breast cancer research. The concept is to reach beyond the tarot community and introduce tarot to the greater public as a tool for emotional, spiritual, and physical healing, with a focus on fighting breast cancer. The theme of the deck is “Tarot Pink,” with an emphasis on the tarot’s ability to inspire, empower, and support in a person’s physical wellness journey. Although the financial cause is dedicated to breast cancer research, the deck itself is keyed to all forms of physical healing and the path to wellness. The color pink evokes that healing, compassion, empathy, and soft, understanding, non-judgmental support. You’re going to want to get this deck. Mary Greer is writing an introduction in the guidebook. You’ve got contributions from some of the biggest names in the tarot world: Robert Place of Alchemical Tarot and Tarot of the Sevenfold Mystery; Ciro Marchetti of Gilded Tarot and Legacy of the Divine; Eric Dunne of Tarot Illuminati; Marie White of The Mary-el Tarot; Kris Waldherr of The Goddess Tarot; Pamela Steele of Steele Wizard Tarot; Mary Griffin of The Hezicos Tarot; Emily Carding of The Transparent Oracle and Tarot of the Sidhe; Roxi Sim of Pearls of Wisdom Tarot; Major Tom Schick of Major Tom’s Tarot of Marseille; James Ricklef of Tarot of the Masters; Carrie Paris of the Magpie Oracle; J. R. Rivera of Beautiful Creatures Tarot, and oh my goodness, so many more. You are going to recognize a lot of the names on the contributors list. Tarot Pink will be available as both a mobile app. and a printed deck. The app. will be available as early as July, 2015 and the printed deck available in September, 2015. Please support our efforts over at Indiegogo and please help share news of this deck and our fundraising via social media with #TarotPink. This is definitely going to be a keepsake deck. A lot of incredible folk have infused these cards with the kind of positive, empowering Qi energy that would help in any path to healing, so use it for yourself, use it for those reading the cards for their healing journey, get it as an inspirational gift for someone, or heck, get it as a collector’s deck. Considering the kind of efforts that have been devoted to the creation of Tarot Pink and the practitioners who’ve worked on it, this deck is going to vibrate at a very cool higher frequency, if you ask me. If nothing else, please get the tarot app for your smartphone. It’s only a $2 donation. Do it! That is less than your morning cup of joe! I was so honored and red with delight when Ron invited me to contribute to this amazing project. I hope by sharing about my card contribution, you’ll be inspired to go out and read about all the other amazing tarot people and artists and what they’ve done for this deck. And then, of course, actually get a copy! I’m not sure I have the authority to show you other works, so I won’t, but you have to go searching for them. My below doodle looks rinky-dink compared to what others have done. AH-MAZING! stuff. Go forth to plan out an ambitious future. You are called to aspire for the horizon beyond. The orb symbolizes healing and the power that love has for overcoming obstacles. Gaze into that orb and you will see: you walk the path of a soldier. Progress.